Read day 1 of SoapBox (UG Candidates) here. 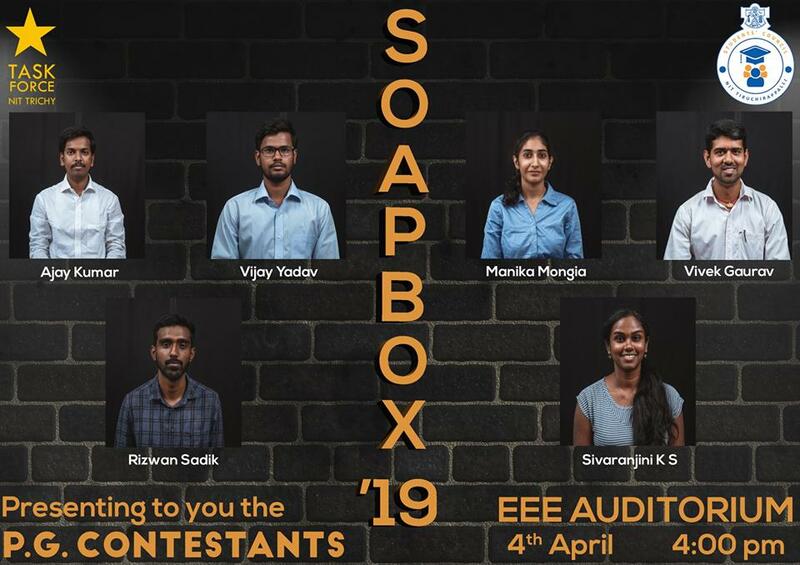 Day 2 of SoapBox took place on 4th April, 2019 in the EEE auditorium. This time the stage was set for the PG candidates to highlight their views and manifestos. The format followed a presentation of their manifesto followed by a panel discussion. The panel consisted of previous and current PG Student Council representatives. Running unopposed, Vivek Gaurav took the chance to talk about what this post meant to him – representing scholars and their problems to the admin. He asserted that although research scholars form a minor fraction of the campus population, their contribution to the institute’s recognition cannot be undermined. He proceeded to explain his manifesto, starting with setting up of a centralized research facility, improving equipment and hiring skilled operators, creating awareness on conference funding agencies and increasing interaction with subject experts. He suggested working with the Training & Placement cell to get opportunities for scholars to work at R&D labs at companies. Finally, when it came to student welfare, he touched upon tapping into rain water harvesting and solar energy, dealing with transport and waste management issues. The panel went through his promises point by point and had a discussion on how he would go about tackling problems and issues. Vivek had done his research on a lot of the issues he brought up. The post was contested for by a single candidate, Sivaranjini KS. After presenting her manifesto, she was questioned briefly by the present council on her manifesto, roles and responsibility. She suggested creating a streamlined process for instrument repair, since the current process takes a large chunk of time. She also proposed increasing the number of dustbins on campus, which the council disagreed with, citing the fact that the campus has enough dustbins that are strategically placed. Another point on which the council disagreed with was her proposal of removing curfew for girls. The council remained firm on the point that it isn’t possible to change curfew rules, since they have been attempting to do so for many years. The council agreed on the fact that the WiFi restrictions must be removed, and that a recreation center was needed inside Beryl. This post was also contended by a single candidate, Manika Mongia. She said her plan of action was to arrive at solutions by asking questions. She began by saying she would figure out how to recycle trash efficiently, create open gyms and parks, and set up soft skill development courses. She also suggested starting a PG club for culturals. A few initiatives she plans to implement in Opal are improving computer labs, hiring a gym trainer and trying to extend to curfew till 9.30. Later, the panel went on to question her knowledge on the responsibilities of a PG secretary and asked her how she would exactly go about implementing her ideas. The post of PG Secretary for M.Tech students is up between the three candidates – Ajay Kumar, Vijay Yadav and Rizwan Sadik. Ajay started off by talking about what his responsibilities would be as PG Secretary. He then went on to present his manifesto covering PG orientation, updating the books in the library, extension of library timings and reduce lab equipment fees. Coming to student welfare, he said he would try to combat water issues, regulate auto prices and improve WiFi facilities. He suggested starting an alumni group and tech clubs specifically for PG students. He concluded with his suggestions to make mess cards online and opening a cycle shop near Orion or LHC. Vijay began with asserting that he had asked and gotten to know the issues faced in Aquamarine and Opal. His manifesto covered library timings, making the stipend and scholarship process smoother, increasing girls’ involvement and creating a site for students to register their complaints on. Rizwan Sadik spoke about increasing stipend for PG students, and a small talk ensued on how this would be implemented. He also talked about reestablishing the Mess Committee, and how a step like this would improve the quality of mess food. Citing the lack of resources, he talked about increasing the number of reference books in the library and introducing an online portal where all reference books would be available in an ebook format. Choose your voice on April 8th.